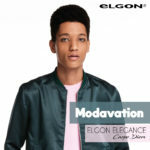 Elgon has the answer to banish these undesired red tones. It’s called Anti-red Shampoo pH 6 from the Colorcare line, the complete and dependable line for all phases of the coloring service. More specifically, the green pigments in our Anti-Red Shampoo pH 6 neutralise red hues by restoring the natural pigments in brown hair. This is exactly what Peter wanted for his hair! “I work as an Educator for Elgon, meaning that those who take part in my courses, just like my customers, must learn to trust me completely. Colorcare is one of those lines that helps to build trust, especially in the salon, since I have complete confidence in the range: I know that I can provide my clients with an enjoyable and professional color service, resulting in happy, healthy hair. In my line of work, I am often asked to banish red tones from warm brown hair and the Anti-red Shampoo from the Colorcare line is just perfect for the job, owing to the green pigments that neutralise undesired red reflections”. This is therefore the perfect product to achieve a true brown, in line with the customer’s wishes and individual personality.